25 Players Remain, and the clock has been paused with 10:02 left in Level 17 (2,000/4,000 blinds and a 500 ante. The average chip stack is 160,000. The remaining 45 players are now on a 60 minute dinner break. 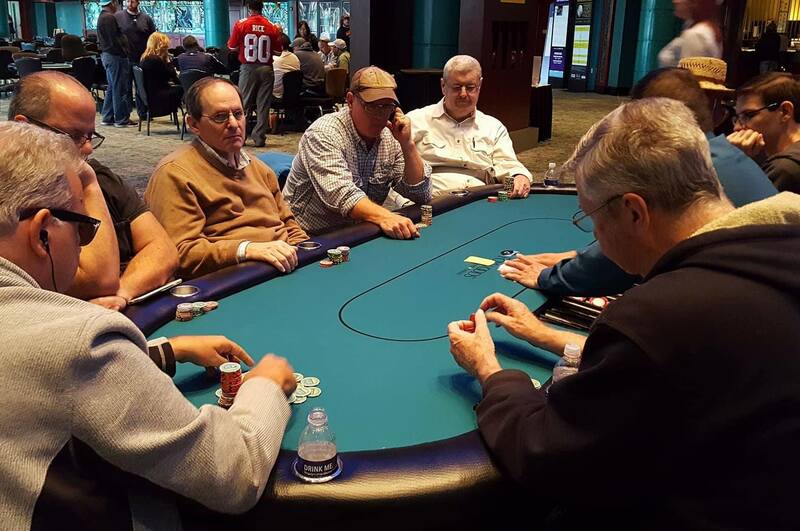 They will return at 8:00 pm to play Level 14, with 1,000/2,000 blinds, and a 300 ante. Players have just returned from their third break of the day. Play will continue through two more levels, and the remaining players will then take a 60 minute dinner break, around 6:50 Eastern Time. Level nine has just begun, which means that registration is now officially closed for the first flight of the $600 no-limit hold'em re-entry event. There were a total of 208 entries in Day 1A. They will play down to the final 25 players before bagging and tagging later tonight. The 25 advancing Flight A players will join the advancing players from Flights B, C, and D to play Day 2 on Thursday October 5th at 12:00pm. All players that make Day 2 will return in the money. 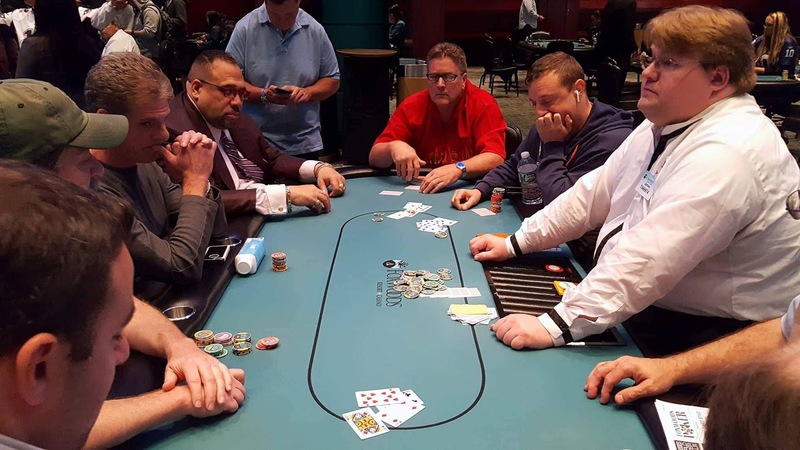 At the time of this post there are currently 124 players remaining with an average stack of 32,741 at 300/600 blinds, and a 100 ante. 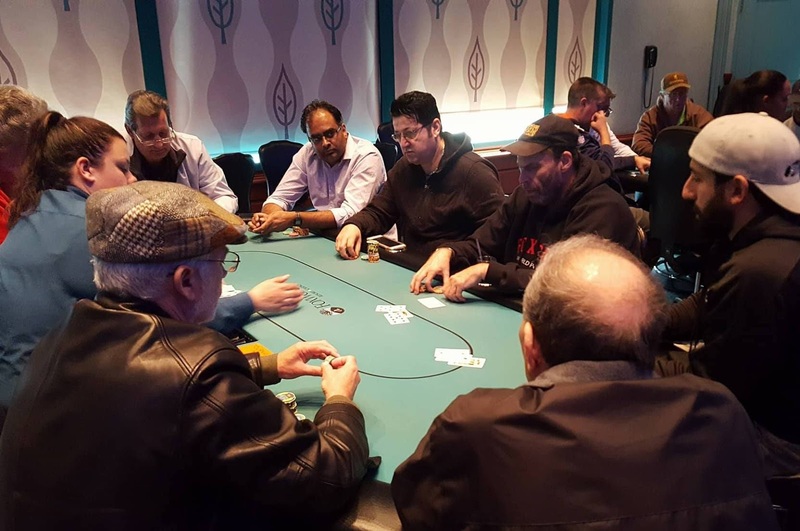 There were a total of 81 entries in today's 7-Card Stud event. Those entries generated a prizepool of $20,428, with 9 spots making the money. 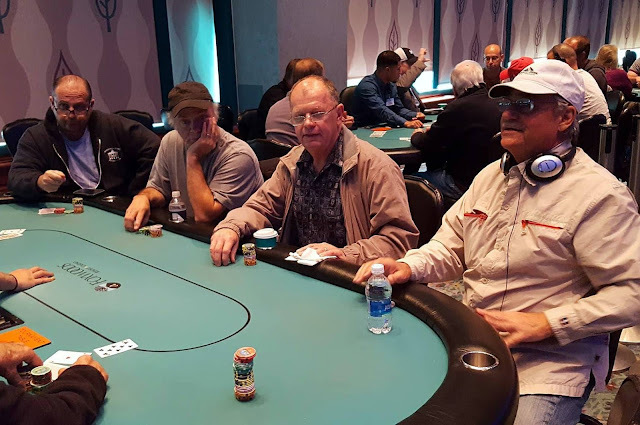 Below are just a few of the notables in the field so far in the first of four starting flights of Event #1 - $600 No-Limit Hold'em Multi-Flight Re-Entry. 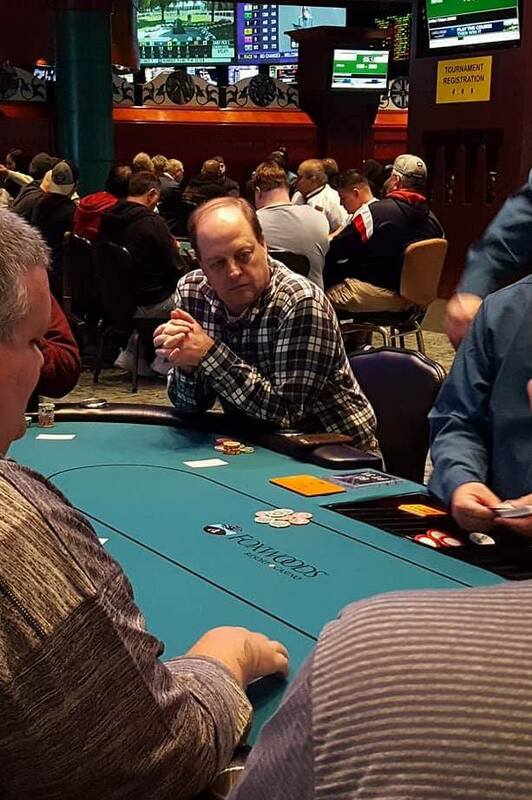 Current chip leader Jeffrey Higgins is fresh off of his first World Series of Poker Circuit ring victory. 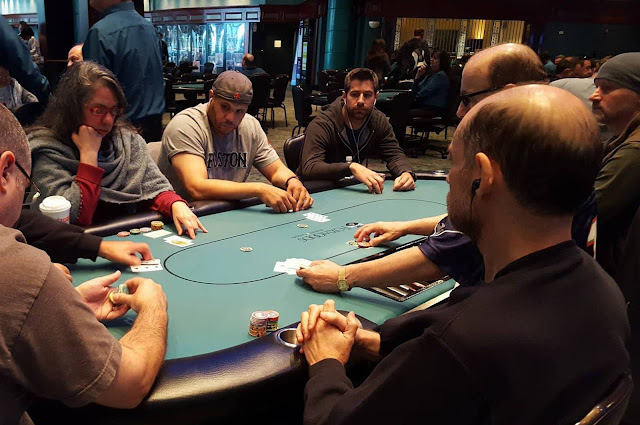 Higgins has a close call in the Foxwoods WSOP Circuit series when after placing 7th in a $365 NLH Event #8, but just took down Event #5 (a $365 No-Limit Hold'em Freezeout Event) for $12,877 in Florida earlier this week. Higgins has traveled to Foxwoods to try his hand at the World Poker Finals Events in attempts to "ride the wave". Higgins currently resides in Northborough, Mass, and focuses on pot-limit Omaha when he is not otherwise with his family his working as a real estate broker. 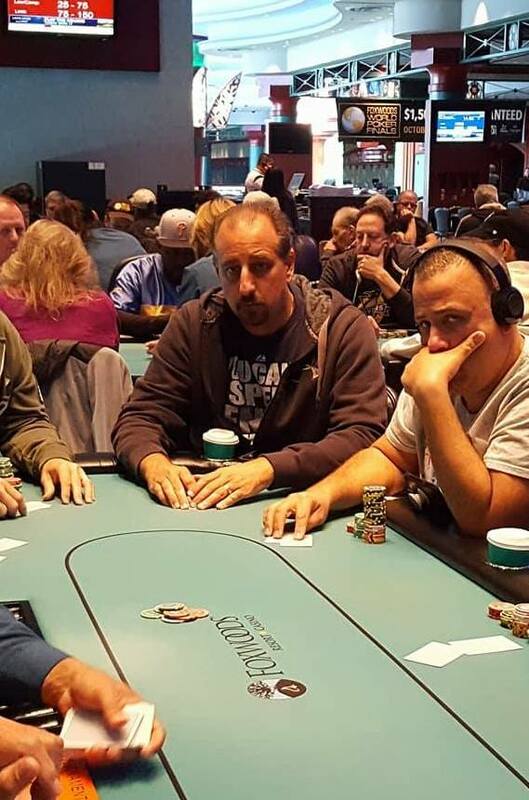 Ralph Macri is all in for his remaining 650 in chips, and has been called by three players. "You missed a big one," Macri says to the foxwoodspoker.com blog staff, "I flopped the nut flush against his flopped straight flush." Which explains his current all-in for only 650 in tournament chis. The flop comes 10♥9♦5♦. The big blind checks, a player in middle position checks, another player in middle position bets 3,000, and both of the other players fold. Macri turns over 8♥5♥ for a pair of fives, but his opponent shows 10♠2♠ for top pair. The Q♣ turn does not change the hand, but the 8♣ on the river gives Macri two pair to quadruple up. "What an easy game," Macris says with a smile as the pot is passed over to him. "try something new" in today's Stud event. Below is a look at a few photos from today's Stud field. The feature table of Event #1 is now streaming live on Twitch. The link to the stream can be found above. Seat 5 - Wallace Johnson Jr. Event #2 is now underway. Last October, James Jessop took home the 7-Card Stud trophy, and the top prize of $4,502. At the present moment there are 43 entrants at the very start of Level 1. Players wishing to enter have until the the start of level 5 to do so, but there are no re-entries allowed in this event so once a player is a eliminated they do not have the option to re-enter. For full details of this event, including structure information, please see below. Flight A of Event #1 is now underway. At the present moment, the clock shows 96 entrants. Anyone wishing to enter/re-enter has until the start of Level 9 to do so. This tournament hosts a whopping $500,000 guarantee, and features three starting flights. Full information about this event, including structure sheet can be found below.